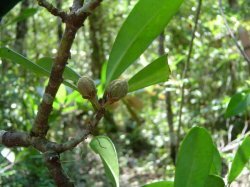 Comprehensive botanical inventories are being conducted in each of the six priority sites for littoral forest conservation with the goal of identifying threatened species and assessing the overall species composition. Results of inventory work will be used to evaluate patterns of species richness, endemism, and species turnover rates along a latitudinal gradient. For the Mahabo forest, work is done in collaboration with local people with the purposes of prioritizing and implementing conservation strategies at the community level. 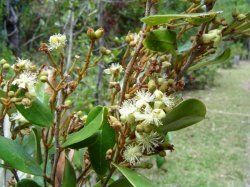 The botanical inventory of the Mahabo Forest has resulted in a current list that includes 288 species of higher plants belonging to 94 families, although additional work planned for the next few years will reveal many more. Among the small sample of species evaluated for their risk of extinction, 14 species were assessed as Vulnerable and eight as Endangered. Destruction of littoral forest along the eastern coast of Madagascar has been rapid in the last several decades. It is estimated that over 80% of original littoral forest has been lost, yet these forests contain approximately 1,200 plant species, or 10% of Madagascar’s flora; of these species, about half are found only in this vegetation type. One of the largest remaining fragments of littoral forest, with an area of 3830 acres, is the Agnalazaha or Mahabo Forest, in the Commune of Mahabo-Mananivo, in south-eastern Madagascar. Our inventories show that the forest and its adjacent marshes, rivers and lakes support a rich flora and fauna including several species that are locally endemic and threatened, such as the rare and endangered gray-headed lemur Eulemurcinereiceps. The forest also makes an important contribution to the livelihoods and cultural life of local people through the diverse goods and services that it provides. 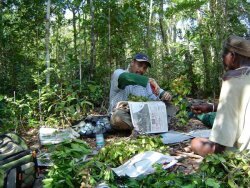 The organization of a diverse educational campaign to increase awareness among local stakeholders of the importance of the forest, how it is threatened, and how it can be conserved and used sustainably. These efforts have halted the destruction and degradation of the forest and are enabling its natural regeneration. During the project, the number of gray-headed lemurs living within the forest, a powerful indicator of conservation success, has risen from around 40 to 140 individuals. This project has been supported over the years by many organizations, including the Beneficia Foundation, Conservation International, the Liz Claiborne and Art Ortenberg Foundation, the Mohamed bin Zayed Species Conservation Fund, and Rio Tinto.